If you’ve recently brought home your first puppy and are starting to realize you may have gotten in over your head, don’t worry -- you’re not alone. Many new pet parents feel overwhelmed by the amount of time and attention pets require, not to mention the extra cleaning associated with having a hairy, slobbery, and energetic roommate. Here are a few things you can do to deal with some of the most common pooch problems. You take everyone to the bathroom, turn out the light, and settle in for an eight-hour nap. But your dog has different ideas. There are numerous reasons a dog may stay up into the wee hours of the morning barking, whining, and crying. These include boredom and an innate desire for your undivided attention. Unfortunately, a barking dog is a quick ticket to trouble with the neighbors. Not only could you be forced to move if you’re a renter, but you can also be taken to court and fined for violating the local noise ordinance. Start by talking to your neighbors and giving them a heads up that you’re training a new puppy. You should also exercise your dog before bed and desensitize him to normal noises. The Humane Society offers more tips on how to control bothersome barking. Young puppies are just as curious as toddlers and will sniff, scratch, and trash everything that’s not out of reach. In addition to quelling their curiosity, dogs will act out to get attention or to relieve frustration, especially if they aren’t getting enough physical activity for their breed and temperament. If you don’t have time to spend walking and running with your dog, consider finding a local dog walker who can stop by a few times each day to check in on Spot while you’re at work. Just one or two 30-minute walks may be enough to expend pent-up energy. You may also consider bringing a pet sitter into your home to keep your dog company. This is a great option if you have a dog displaying signs of separation anxiety, which Dr. Sophia Yin says can be cured by systematically increasing the time you’re away from your pet. By giving your dog a social and physical outlet, you can prevent many issues, such as chewed-up furniture and knocked-over trash bins. In the wild, wolves lick each other’s faces upon reuniting with a member of their pack. This up-close-and-personal contact serves the secondary purpose of letting the greeting wolf know where his newly-arriving counterpart has been, if he’s recently eaten, or is ill. Dogs have evolved to provide a similar reception for humans. Many playful pups may run up to, jump on, or even knock down any friendly face in their path. This isn’t aggression, but rather, their way of saying, “Hi! Let’s play!” Like many other common behavioral problems, exercise seems to be the key to keeping your canine calm. 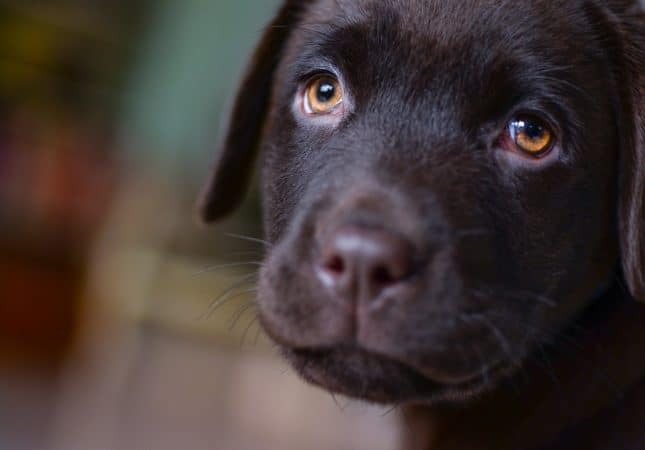 Labrador Training HQ offers tips and advice on how to calm a hyper dog, and suggests you take action to make sure you aren’t reinforcing any bad behavior. Even if you wear your dog down with long walks and recreational runs, you still have to make sure your home is a safe place. Remove poisonous plants from inside the home and in any outdoor areas where your dog will play. Make sure you feed them a high-quality organic food to prevent stomach discomfort and diarrhea, the latter of which is no fun to clean up. Keep a tight lid on the trashcan, limit access to bedrooms, bathrooms, and the kitchen, and make sure they always wear a properly-fitted collar with accurate contact information on the tags. By taking the time to train your pets, prep your home for their safety, and offering plenty of opportunities to work their muscles, you can prevent many of the most common problems associated with pet ownership. It takes time, patience, and persistence, but the unconditional love you receive is more than worth the hassle. An avid blogger Douglas Brooks is extremely fond of living his life on the edge. A major believer in the adventure associated with hunting he likes to put all his experiences on paper. Quite passionate about the outdoors and the wild he loves to inform people about the problems he had to face and suggest ways to overcome them.